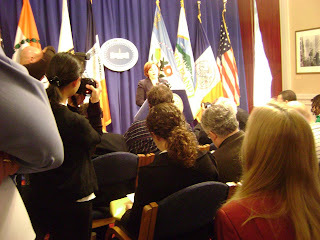 In a tightly controlled "press conference" today (Oct. 12th, 2008) in City Hall, which your correspondent attended, New York City Council Speaker Christine Quinn announced her support for Bloomberg's Banana Republic power-grab to extended his term in office based on "these hard economic times" as if he was the only one who could "save" us from the global financial, derivative "melt-down." This move by the Speaker might effectively end her chance to ever be Mayor. [Maria Passonante-Durr stated her intention to run against Quinn in a Primary.] The press were wimps who failed to question the Speaker, and after taking a few perfunctory questions, Quinn left the room. 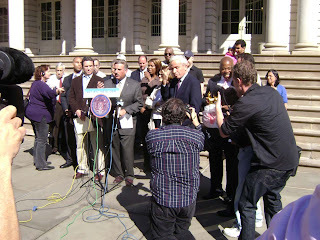 Afterwards, the press had ample time to interview Mayoral hopeful Anthony Weiner on the City Hall steps. Before the Quinn announcement, there was a press conference against the term-limits extension with Norman Siegel (who is expected to lead the legal challenge if the Council changes the term limits), Mark Green, Henry Stern, State Senator Eric Adams, Councilmembers David Weprin and Letitia James, Betsy Gotbaum, Assemblyman Jefferies, Anthony Weiner, M.C., among others.